The death of her husband, Colonel Lewis Braxton Grigsby, presented formidable problems for Susan Grisby. As was the case with many widows of influential and prominent men, she was suddenly left on her own to maintain her lifestyle and support her two children. And Grigsby’s estate was not considerable. After sending the children off to schools, Susan kept up appearances in the horse sporting circles of Lexington, Kentucky—she was so popular that reportedly three racehorses were named after her, including the winner of the 1884 Kentucky Derby. But money issues plagued her. So Susan Grigsby made a life-changing decision. In order to keep her children in Catholic-operated schools—son Braxton in Dayton, Ohio at St. Mary’s Seminary and Emelie in an Ursuline convent in Brown County, Ohio—she opened a high-end brothel in Cincinnati. Young Emelie received an education in culture and creativity. The nuns taught the girls American and European history and pressed them to discover their own intellect—writing plays and poems, for instance. She left the convent a refined and cultured young woman who could comfortably interact in the drawing rooms of polite society. She also left with a troubling awareness. The nuns had revealed her mother’s profession to her, saying it was now her cross to bear. Emilie realized that the only way to escape the fate her mother endured was to acquire money and social status. 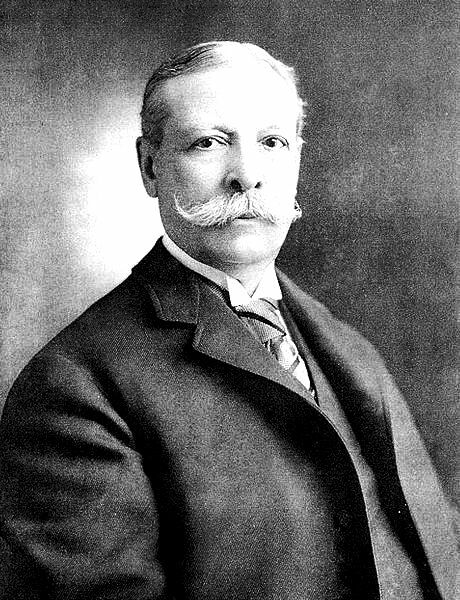 Her brother, Braxton, became private secretary to the Chicago financier Charles T. Yerkes. Yerkes controlled most of the city’s street railway system and in 1892 donated nearly $300,000 to the University of Chicago to build the Yerkes Observatory in Wisconsin. It included the world’s largest telescope. That same year he met the sixteen-year old Emilie Grigsby. Also smitten with the beauty was Yerkes’s son, Charles Edward, and within months an impending engagement was rumored. Emilie apparently liked young Charles—perhaps even loved him—but the golden goose was not the son, but the father. When it became evident that Charles's intended wife was seeing his father the romance was off and for months the father and son did not speak. The palace was No. 864 Fifth Avenue which sat across from Central Park between 67th and 68th Streets, surrounded by the mansions of New York’s wealthiest and most powerful titans. Two blocks away on Park Avenue Yerkes began building another palace—this one for Emilie Grisby. Completed in 1898, it replaced a row of brownstone homes of a generation earlier. Twenty feet deep—the width of a single house on 67th Street—it stretched northward 100 feet along Park Avenue, halfway to 68th Street. The white granite mansion rose five stories, capped by a tiled roof of peaked dormers, finials and exuberant cresting behind a tall stone balustrade. Albert Herter painted the canvas panels that were then applied to the ceilings and walls. One guest bedroom was lined with fifteen needlework tapestries, each costing $15,000. Her music room engulfed the entire fourth floor and included a carved Vernis Martin piano, covered entirely in gold leaf. In this room was a chair covered in ivory carvings. “This chair, which is of the highbacked side variety, is placed upon a small dais at the one end of the room as a further warning to the rash visitor that it is for ornament rather than use,” said The Times. An avid collector, Emilie filled the mansion with art—a collection of jade, miniatures including one of Henry VIII, Flemish tapestries and paintings. There was a Louis XVI “rose room,” a Napoleonic bedroom, and Emilie’s own room paneled in Italian walnut decorated with blue and white Chinese porcelains. The library housed expensively bound volumes. “The bookcases and closets were all built into the walls, and the doors set in panels matching exactly the paneling of the rooms. The collection of books, shelved behind these carved doors, is said to be valuable,” said The Times. “Just above the landing half way up one flight of stairs in the house, is a life-sized portrait of a beautiful young woman, Miss Grigsby, herself,” said The Times. Emilie now had the financial means to rescue her mother from her scandalous profession and invited her to live in New York. That being accomplished, she turned her attention to the one thing she wanted most of all: social acceptance. The wagging tongues and suspicious minds of Manhattan’s wealthy wanted desperately to know the pedigree of this mysterious refined woman who owned a Park Avenue mansion and had apparently unlimited funds. It would not be long before the story of Emilie’s mother was discovered as well as the source of the fortune. The doors of Fifth Avenue quickly began closing. In the summer of 1905 Emilie was in London with Yerkes, who was now 68, when he became seriously ill. She nursed him for five weeks. Back in New York a few months later he was near death. The millionaire was staying at the Waldorf-Astoria rather than the Fifth Avenue mansion and as the end neared he pleaded to see Emilie, rather than his wife. There was no mention of Emilie Grigsby in the Yerkes will which spread upwards of $25 million among relatives and charities. Emilie had been, however, well taken care of. Although she continued on in her lavish lifestyle, her bitterness towards Manhattan society festered. She spent more time abroad; away from the elite social circle that was closed to her. Also aboard the Red Star liner were Mrs. Stephen B. Elkins, the wife of the West Virginia senator, and her daughter. Like Emilie, Mrs. Elkins was traveling with servants but unlike Emilie, hers were all white. The uncomfortable situation was resolved by the Captain who decided in favor of the Elkins contingent, arranging that Emilie’s servants would be served later. 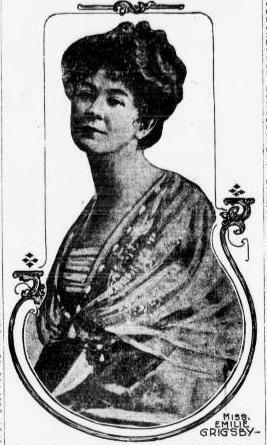 Beginning in the spring of 1911 the New York press began receiving special cables telling of Emilie Grigsby’s social success among the Mayfair crowd of London. The glittering events and social coups were relayed to the possibly-envious group that had spurned her. New Yorkers read with amazement that when Emilie called on her friend, the French secretary and reader for the Queen, at Buckingham Palace, she met Princess Mary. The princess, they read, “took an immediate liking to her charming American visitor, the latter treating her as a girl, and not as a Princess. As the Coronation drew near, Emilie Grigsby must have inwardly glowed as the women of New York read that she and her mother had been invited as the King and Queen’s special guests in a box near Princess Mary and her three youngest brothers. “The gala performances at the Opera and His Majesty’s Theatre are also honored by Miss Grigsby’s presence, and, at the latter, she sat next to the Duchess of Marlborough,” reported The Times. Before Emilie could return to New York to dispose of her Park Avenue mansion, antique furnishings and art treasures, however, she was found out. The cables that leaked her social triumphs and personal relationship with the royal family had come from her. Her inventive stories to retaliate against those who had hurt and spurned her went too far—far enough to raise the attention of Buckingham Palace. 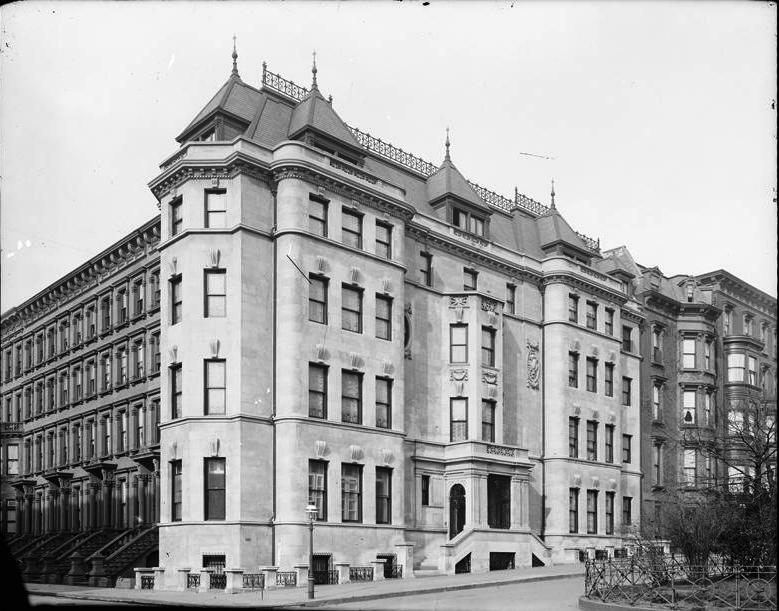 While Emilie Grigsby dallied with doctors and military officers, her sumptuous Park Avenue mansion was divided into luxurious apartments. In February 1915 Mrs. Philip O. Barlett gave a dinner dance in her apartment and in May 1920 Mrs. Wilbur Knox Mathews and her daughter Currie Duke Mathews took an apartment here. Later that year, in October, Currie’s engagement to Francis Higginson Cabot, Jr. was announced. The Grigsby mansion would not last much longer, however. In 1926 Frederick Ecker, a vice president of Metropolitan Life Insurance, commissioned architects York & Sawyer to design a luxury cooperative apartment building on the site. 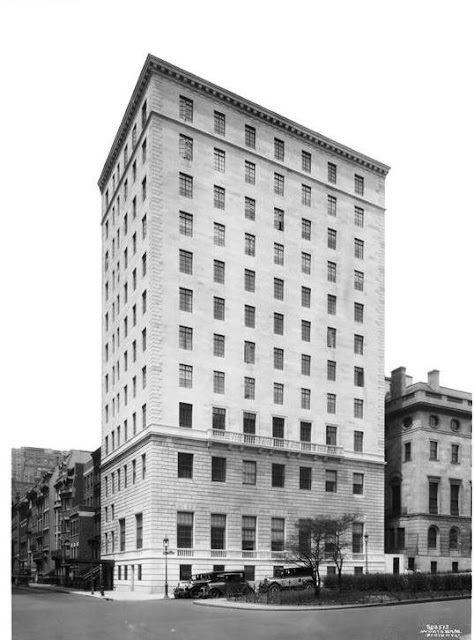 Ecker intended to live here himself, and the first three floors were designed as the 27-room apartment of Virginia Vanderbilt. Coincidentally, Mrs. Vanderbilt was leaving her mansion at No. 666 Fifth Avenue and in a later renumbering, the new building would become No. 666 Park Avenue. Although Emilie Grigsby’s magnificent mansion was soon gone, she was not. She entertained in her Mayfair house, entertaining the likes of William Butler Yeats, Auguste Rodin and military officials. She offered her country house Old Meadows to Field Marshall Sir John French and Field Marshall Lord Kitchener for a quiet dinner meeting during World War I. Poet Rupert Brooke spent his last night in England at Old Meadows and Emily later had the lines he wrote in the visitors’ book engraved in bronze over the doorway. She lived on, unmarried, retaining the ephemeral beauty and poise that had captivated a railroad tycoon. As in London, Emilie Grigsby’s death went mostly unnoticed in New York. No one today remembers the magnificent granite-faced mansion on Park Avenue that housed her artworks and golden grand piano. And one of New York City’s most remarkable social stories is largely forgotten. Fascinating story I had not previously known. Thank you for sharing! Her life story would make a fanastic movie or even the basis for a series on Netflix or Amazon She must have been quite brilliant to overcome all that social prejudice in the Edwardian era. I enjoyed reading this post (and will be checking out the book mentioned by Sarah Richards). Thank you for work on this blog. It is a favorite of mine! Emilie Grigsby also attended Mme. Mears private School in Manhattan, where she was a classmate of my grandmother's (Beatrix Alicia Garsia). She and Emilie became lifelong friends. My great grandfather, Alfred Charles Garsia, was a great friend of C.T. Yerkes and he and his wife & two daughters were often included in the formal soirees in the Yerkes' mansion on Park Avenue. When granny married Henry Francis Loomis in 1896, Mr. Yerkes sent the couple on their honeymoon in one of his private railway cars with a full staff, exotic foods, wine and champagne. C.T. Yerkes was my mother's godfather at her baptism in Nov. 1898. As a small child I used to play "dress up" in some of the Edwardian fashions and fancy dress ball costumes Emilie had given granny - so I can testify to her petite stature and build! Wonderful memories! Fascinating lady! What a fascinating story! thank you so much for sharing this. Just yesterday I finished reading 'The Stoic' by Theodor Dreiser. The first thing I did in the morning was to search the web for any info about Mr. Yerkes and the fascinating 'Berenice'. Thanks a lot for the post and interesting comments about Ms. Emilie Grigsby. Good to know that the prototypes of the main characters were as outstanding as they are described in the book.